Why Do the Scalene Muscles Get Tight? 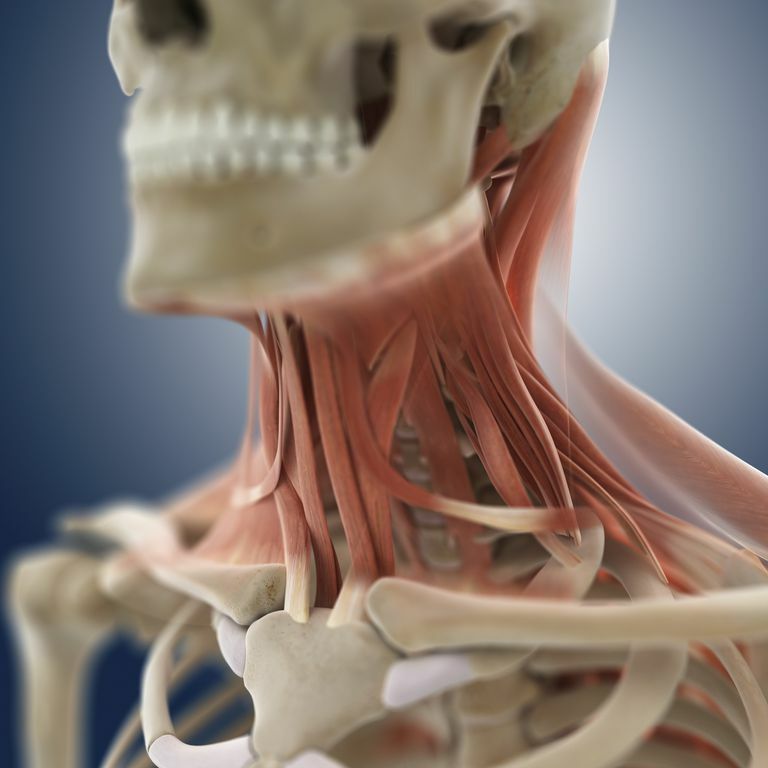 You have more than 100 muscles in your neck, head, and face area. They help you perform thousands of actions every single day, everything from looking over your shoulders when parallel parking or changing lanes on the freeway to blinking tears back when we’re sad to take a bite of your favorite food. The scalenes are one of these muscle groups in your neck, and they're the ones that may often give you problems because they're prone to a lot of tension. They are made up of three muscles, with one set located on either side of your body. To imagine what they look like you might think of the angled rigging of a ship’s mast; the scalenes resemble and are positioned on the neck and collarbone similarly. When the scalenes are healthy and working in a balanced way, they help support the upright posture of your cervical spine, which is the area of the spine that correlates with your neck. But because they're prone to a lot of tension, these muscles also play a role in common medical conditions affecting the neck. Before we dive into these conditions and what you can do to loosen your scalenes, let's take a closer look at the three groups. These are some of the terms and ideas mentioned below—reading through them is optional but may prove to be helpful. Anterior Scalenes: Of the three muscles that make up the scalenes, the anterior is located closest to the front (anterior is a directional term indicating front or forward). Just the same, like all scalene muscles, it is considered a side neck muscle. So what does the anterior scalene muscle actually do for you? A number of things, but first, it’s helpful to remember that you have these muscles on both sides of your neck. The anterior scalene, when acting on one side of your neck only, can bend and rotate your neck. It also lifts the first rib, but that’s a pretty subtle action that escapes your awareness while it’s happening. When the anterior scalene on one side of the neck works with its counterpart that is located on the other side (this is called “acting bilaterally"), it flexes (bends) your neck. Interestingly, the anterior scalene muscle is considered an accessory breathing muscle because it lifts the first rib during an inhale. Medial Scalenes: As the name suggests, the medial scalene (scalenus medius) resides between the anterior and posterior branches of the scalene muscle. As with the other muscle branches of this group, the fact that you have a medial scalene on either side of your neck, plus the fact that each works in tandem with the other scalene muscles, means that the medius—as well as the others—produce more than one action. When only one side (either the right or left muscle) is contracting, the job of the scalenus medius is to lift (also called elevate) the first rib, to flex (bend), and to laterally bend the neck. When the medial scalene on both sides are contracting, they flex the neck. These actions are very similar to those of the anterior scalene, probably because the attachment sites (origins and insertions) for both of the branches are located very near one another. The scalenus posterior muscle is considered an accessory breathing muscle because it lifts the first rib during inhaling. Posterior Scalenes: The posterior scalene occupies the back most position of all the scalene muscle branches (posterior means back). It does not contribute to the scalene triangle – only the anterior and medial branches do that. When only one posterior scalene is contracting, it flexes and rotates the neck joints, as do the other two scalenes. When both right and left posterior scalenes are working, the result is neck flexion and also a raising of the second rib, an action that may be difficult to detect when it’s happening. The posterior scalene muscle is considered an accessory breathing muscle because it lifts the second rib during inhaling. The Scalene Triangle: The anterior scalene and the medial scalene, together with part of the first rib, form an anatomical area known as the scalene triangle. Another name for this formation is the scalene fissure or scalene haitus. The scalene triangle is important because the brachial plexus nerve branches pass through it. Scalene tension may compress these branches, and that may be a sign of thoracic outlet syndrome (TOS). Authors of a February 1990 study published in the American Journal of Surgery suggest that fibrotic scalene muscles are an important cause of symptoms in traumatic thoracic outlet syndrome. What Makes the Scalene Muscles Tight? The scalenes are implicated in a number of neck maladies. Below are a few of the more common ones. Torticollis: Torticollis, also known as wry neck, is a condition in which your neck muscles stay contracted in chronically shortened positions. People with torticollis generally live with their neck in a twisted neck position that is very difficult to release. The head also tilts to the opposite side. It’s easy to understand how the scalene muscles may be affected by torticollis—all 3 play key roles in neck rotation and tilting. Sometimes torticollis is due to genetic factors and other times it’s acquired after trauma. That said, twisted neck positions related to genetic torticollis are usually controlled by the nervous system (the genetic variety). Torticollis can also be caused by drugs. Forward Head Posture and Dowager’s Hump: According to Til Luchau, in his article entitled, “Working With the Scalenes,” published online by the Associated Bodywork & Massage Professionals, in these conditions the anterior scalenes are often “hard, tight, and short, pulling the lower cervical vertebra forward into a rigidly flexed position.” People who do bodywork or massage know all too well how tight the scalenes, especially the anterior scalene, can get. Luchau goes on to say that while normally the scalenes help bend the neck forward when you have forward head posture or Dowager’s Hump you’ll likely need to bring your head up so you can see what’s in front of you. This change comes about because, in the forward head position, the scalenes are not in the position to counterbalance tension in the back of the neck, which, in turn, therefore perpetuates the posture problem. Whiplash: While there is little information about scalene tension available via conventional medical research, again, the bodyworkers and massage therapists of the world have a ringside seat to this problem. In the article mentioned above, Luchau also comments on whiplash, saying that scalenes are often affected by this injury, especially when the trauma is on the side of the neck. Luchau warns that deep tissue work on scalenes can aggravate symptoms if done too soon after the inciting incident. Respiratory Problems: The scalene muscles are considered by many to be accessory breathing muscles. They contract when you breathe in, which helps make space in the thorax for the lungs to expand by lifting the top ribs. When you have respiratory issues (for example, asthma) your scalenes may be chronically shortened. Of course, stretching your scalenes is also helpful. To do this tilt your head to one side. This move will likely reach the middle scalene on the other side. As you do the middle scalene stretch, looking up over the shoulder that is opposite to the direction in which you are tilting your head will probably reach the front scalene (called the anterior scalene), while looking down with your head turned towards the same side that your head is tilted can help you reach the back (posterior) scalene. Movement systems such as Feldenkrais, the Alexander Technique, and (the many forms of) somatics may help as well. These systems, and others that are similar, generally approach muscle tension and weakness via the body's alignment, it's capacity to move, and most importantly, the way the brain and spinal cord "talk" to the muscles. Sanders R., Jackson C., Banchero N., Pearce W. Scalene muscle abnormalities in traumatic thoracic outlet syndrome. Am J Surg. 1990 Feb.
Wheeless, C., M.D. Scalenus Posterior. Wheeless Textbook of Orthopaedics presented by Duke Orthopaedics website. Aug. 2011.